We wanted to share our experiences in booking cruises with Expedia.com, and they have not been the smoothest as you'd expect with a regular travel agency. Last year we booked an Alaska cruise for June via a cash-back site (eBates.com) that promised 10% cash back of the total cruise fare (not including tax). The total cruise fare was around $2800, and yet the cash back was reported as only $140. We had to go back and forth with the cash-back site, submitting documents in order to get the $280. Great news! We were able to verify your order from Expedia and have added Cash Back to your account. Feel free to reach out to me if you still have any questions. Happy shopping. We are only able to add Cash Back to your account when stores let us know about your order. We have contacted the store to verify your order. It usually takes about 10 business days for us to hear back, but it may take up to 45 days. We realize this can be an inconvenience, and we appreciate your patience. Feel free to reach out to me if you still have any questions. Thank you. Less than 2 months ago, we booked a cruise with Expedia again, this time it only registered the fare as $75 (so a cash back of $7.50) instead of $1200 for the cruise. Since it hasn't been 8 weeks after travel has completed, we have not been able to have eBates.com look into it. On that same cruise, however, we were promised an onboard credit (OBC), but never saw it once we were aboard the cruise ship. So after returning from the cruise, we called Expedia at (866)221-2731 option 2, and the customer rep said that we had to fill out a redemption form 21 days before sailing in order to get the OBC. All the other travel agencies I have booked in the past did not require any sort of customers filling out an extra form in order to get the advertised on board credit promotion. In addition, even if we had known to fill out the form, our cruise was only 26 days away, leaving a short time frame to send in the form. So that was very disappointing and an unpleasant surprise. It seemed to me that Expedia's practice in this case is to advertise a promotion that it hopes you do not redeem- very shady. The customer rep pretty much told us- too bad. Hope those of you who use Expedia to book cruises will learn from our mistakes. In the future we will be steering clear of this company for booking cruises. Here is an update. We did finally get the 10% cash back, but it was not without hassle. Ebates has yet to receive full credit for this Expedia order, but we went ahead and increased the Cash Back for this purchase in your account. So apparently Expedia is not properly reimbursing eBates. In the end- our verdict on getting cashback with Expedia cruises is not recommended unless for instances where your regular cruise booking agency is not offering you much incentive, for instance e.g. 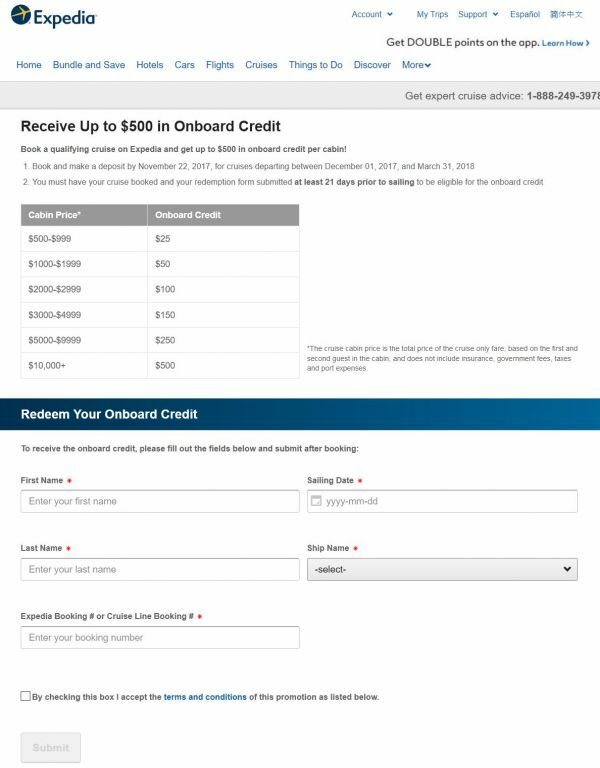 just $25 or $50 OBC (on-board credit) and no other perks.